The Cowl Neck Boxy Tunic is the perfect piece for transitioning into the colder weather. 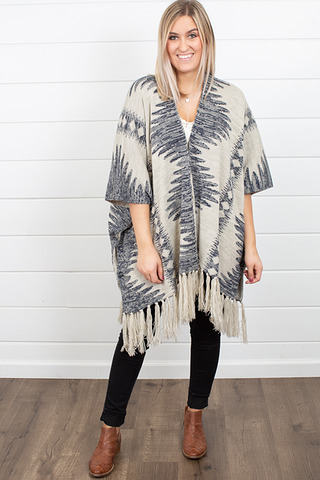 The thick knit makes it super cozy and the chevron print is really eye catching. It's cowl neck and sleeveless detailing is great for layering. This piece is great worn alone with booties and a jacket or add your favorite long sleeve underneath and some black leggings. 100% acrylic. Hand wash and lay flat to dry. For best results dry clean. Photographed with the Brixton Long Sleeve Whisper by Michael Stars.